Crumbling away on the edge of the Latvian coast, a row of abandoned concrete bunkers have formed a lovely line of ruins that harken back to a fort built by Tzarist Russia. When they were created, the ruins encircled the entire city of Liepaja. The Northern Forts were part of Liepaja’s central fortress and they were built between the 19th and 20th century to provide shelter to the naval base. A line of outer fortifications surrounded the whole city. However, in 1908, after less than ten years of construction, the whole fortress was considered a strategic misstep and it was abandoned. There were attempts to blow up parts of it, but destroying such robust fortifications is no easy feat, and the remains still stand today. 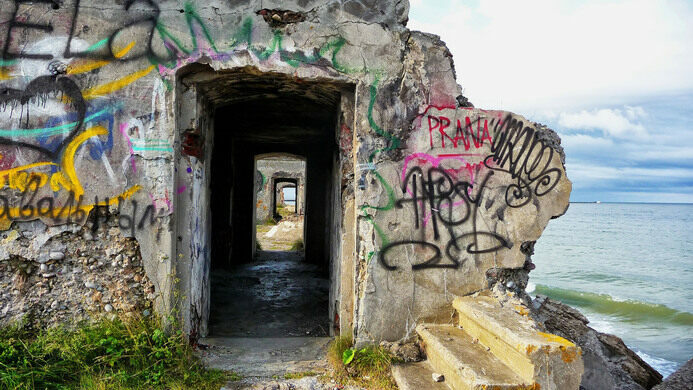 Surprisingly, the efforts to destroy the forts had the effect of creating haunting seaside ruins. Each little stone bunker holds its own secrets. Achieving what man’s powerful explosives could not, the sea has started to take its toll and part of the Northern Forts complex has collapsed to the waterline. This has made it a popular place for youngsters to climb in and around these broken bunkers. The bunkers run along the coast and can be accessed via Krasta street, Koknese street or Jatnieku street. This abandoned secret city is a crumbling wonderland of Soviet ruins.